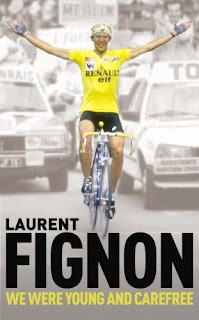 Just before the tragic early death of Laurent Fignon was announced I finished reading his recently translated autobiography. In "We Were Young and Carefree", Fignon presents a characteristically honest and upfront account of his ascent to the heights of world cycling and then his frustrations as his career, and key personal relationships, failed to live up to early expectations. The opening sets the tone for the book when he explains how sick he became of people recognising him as the guy who lost the Tour by 8 seconds. He, justifiably, retorted that no, in fact, he was the guy who WON the Tour twice. Fignon had an unorthodox background for a cyclist of his time and continued to be unorthodox throughout his career. As a rider he was distinctive, direct and aggressive. As a man he was prepared to be different, to be blunt and to undermine traditions he felt blocked progress. His relationship with Cyrille Guimard naturally features a lot in the book giving an insight into both Fignon himself and also going some way to explaining why Guimard eventually fell out with all of his protegés. Fignon was a great of the sport, but he was also an interesting and very unique man. This book captures that and stands as a fitting reminder of someone lost to us too soon. Listen to your body. Yeah, right! Is there a climbers jersey for this?